What Saints would have given for another agonising late loss here. Had they done that, they would have earned the losing bonus point they so desperately needed in the bid to finish in sixth spot in the Aviva Premiership. But as it was, they were never close to getting it. In truth, there was an ocean between the performance levels of these two teams. Exeter looked dangerous every time they attacked. During the first quarter of the game, Saints stood tall to relentless Exeter surges and poached a try through JJ Hanrahan. But the indefatigable nature of the home side, allied with the amount of tackles Jim Mallinder's men had to make, was always going to take its toll. And so it proved towards the end of the game as the floodgates started to open and the Chiefs began to run wild. Saints may have scored twice, but they couldn't have complained if they conceded more than the five tries they did. Because Exeter were so, so dominant here. It was one-way traffic in the west country and salt was rubbed in gaping wounds during the second period. But a little perspective still has to be applied. While many will see this as another horrible Saints display in what has largely been a horrible season, there were extenuating circumstances. Any team missing their two marquee players, Louis Picamoles and George North, their main fly-half, Stephen Myler, their captain, Tom Wood, a former double player of the year, Calum Clark, and one of the most in-form players in the country right now, Courtney Lawes, is going to struggle. Whether it was Exeter or Ealing away, the loss of those men would be felt. There are so many leaders on the sidelines. And you can't expect to rock up to Exeter without them - yes, Lawes did play but was only on for 20 minutes before being forced off - and get a good result. That said, Saints fans will expect far more from the squad members who were on show here. Again, the scrum was a worry, with Saints unable to build any sort of platform. And again, Saints conceded 30 or more points in a match. This is the sixth time in the past eight games that has happened. 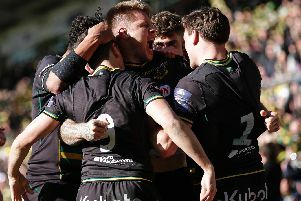 Saints have now lost four matches in a row - though they will know they should have won a couple of those - and they now face a fight to be playing Champions Cup rugby next season. They will have to beat Harlequins at Franklin's Gardens and deprive the team from The Stoop of a losing bonus point. That is a huge challenge, especially considering Saints have now won just one of their 11 games against teams in the Premiership top six this season. They will somehow have to summon a performance that allies attacking edge with defensive resilience. It is something they have only done on a couple of occasions this season. And it is something they certainly didn't do at Sandy Park on Saturday.